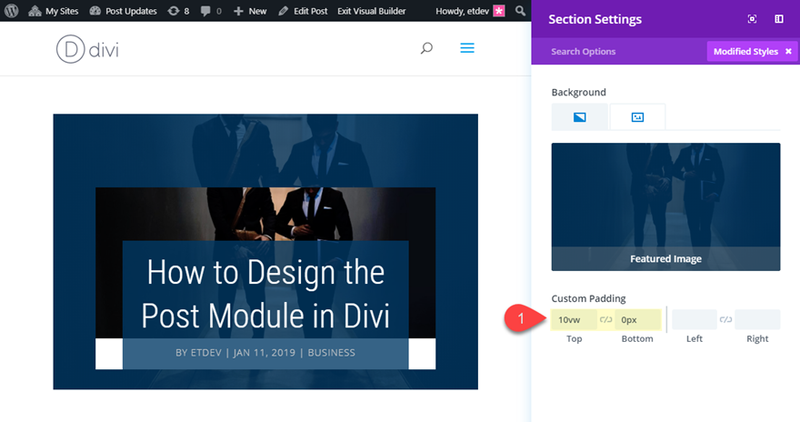 For all you Divi bloggers out there looking for fresh ways engage people with your blog posts, the Divi Post Title Module is a great place to start. 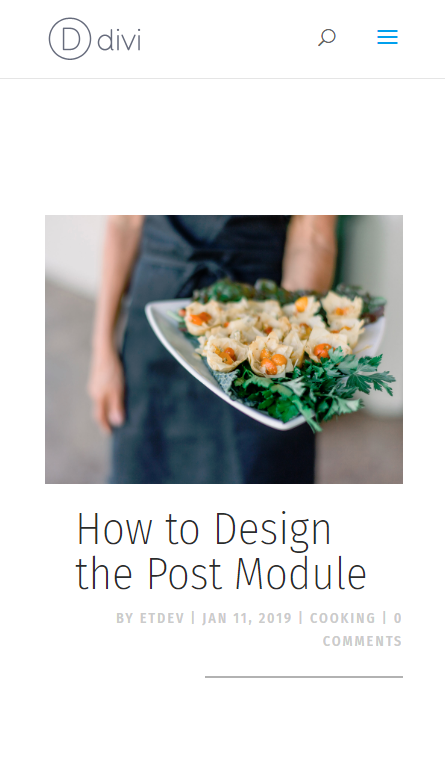 The Post Title Module allows you to style the post title (and featured image) in a variety of ways for countless stunning designs. This allows you to create some beautiful articles that hook your potential readers from the first glimpse. 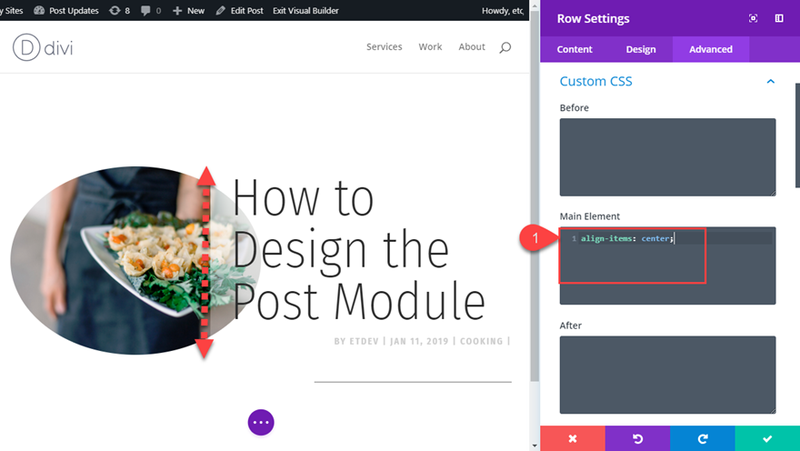 Today, I’m going to show you four stunning ways that you can style the Divi Post Title Module to help pull your readers in. 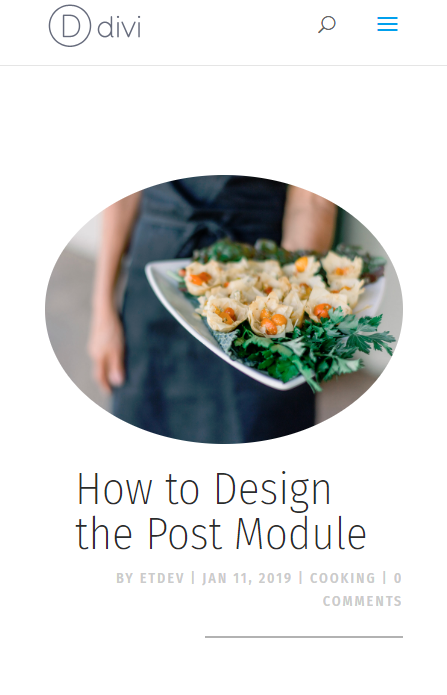 Here is a quick peek at the post title module designs featured in this tutorial. 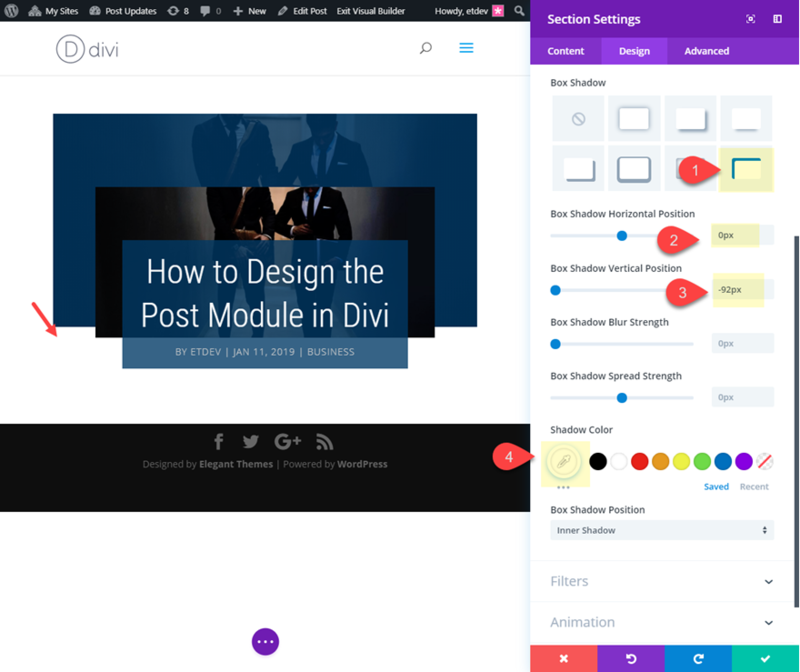 All you really need for this tutorial is Divi. 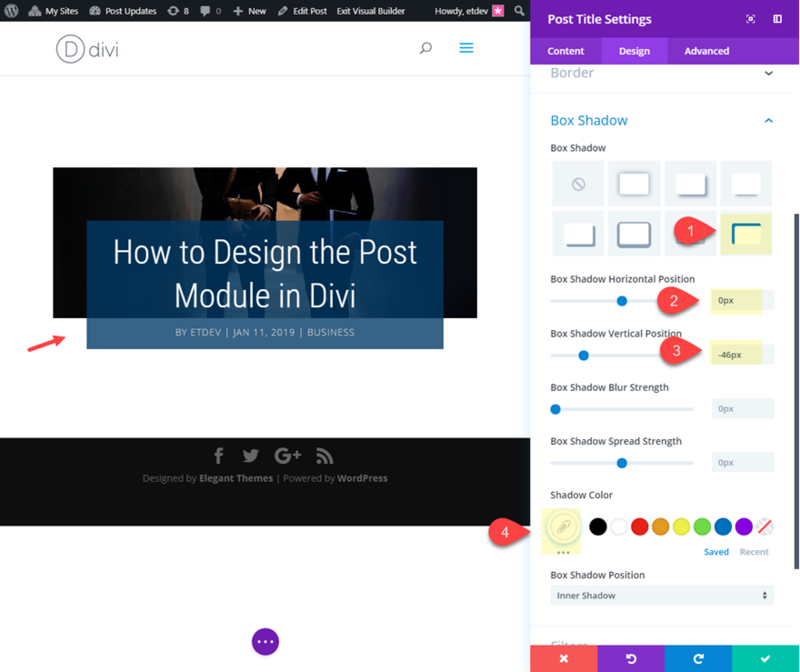 We will be creating new posts and using the Divi Builder to create the post title designs. You will also need a few images to serve as featured images. Add a Title to your post. 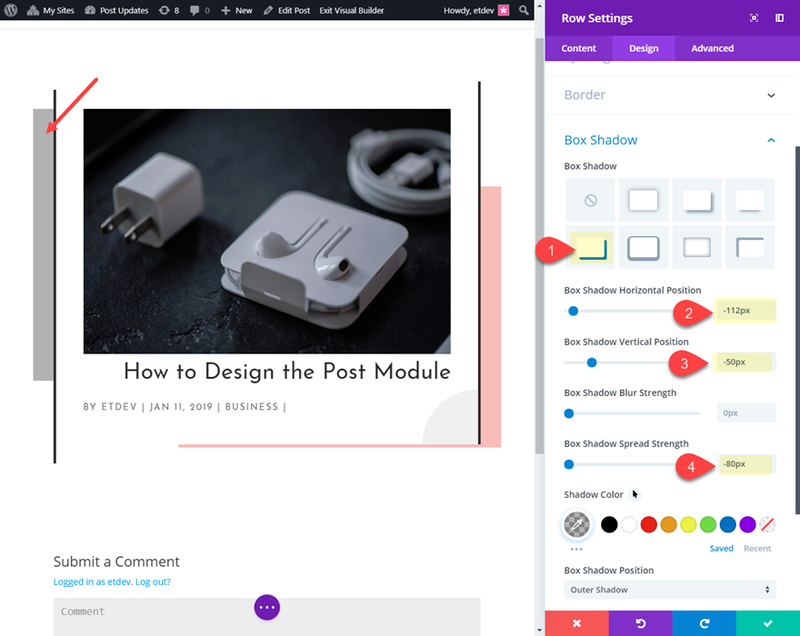 Add a Featured Image to your post. 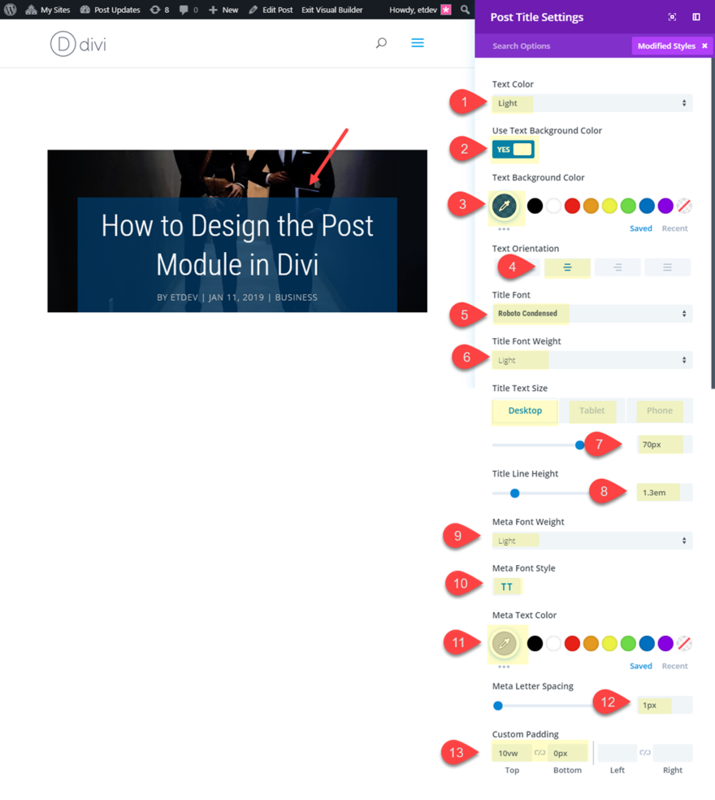 under Divi Page Settings, select the No Sidebar page layout and select to Hide the post title. 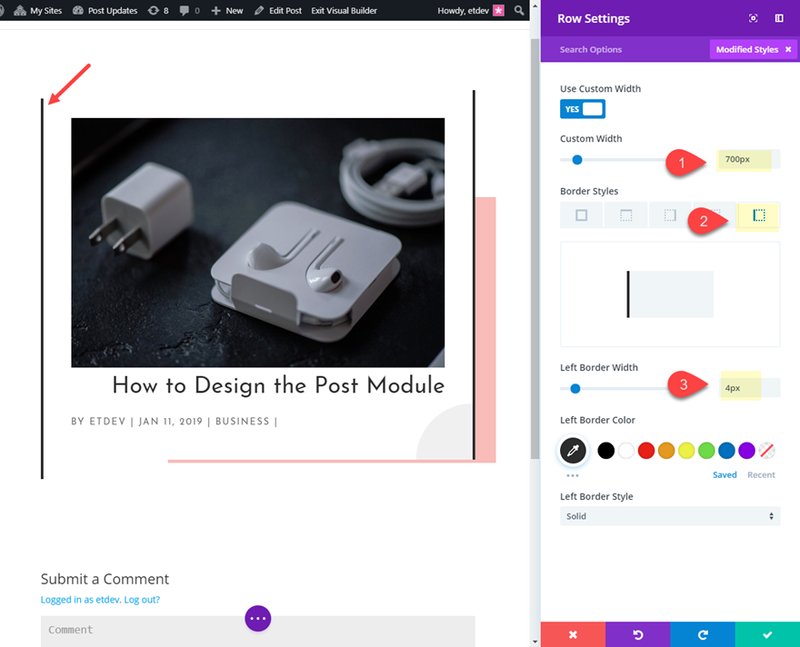 Then click to Build on the Front End or deploy the Desktop view mode on the backend so that you can design the page visually. 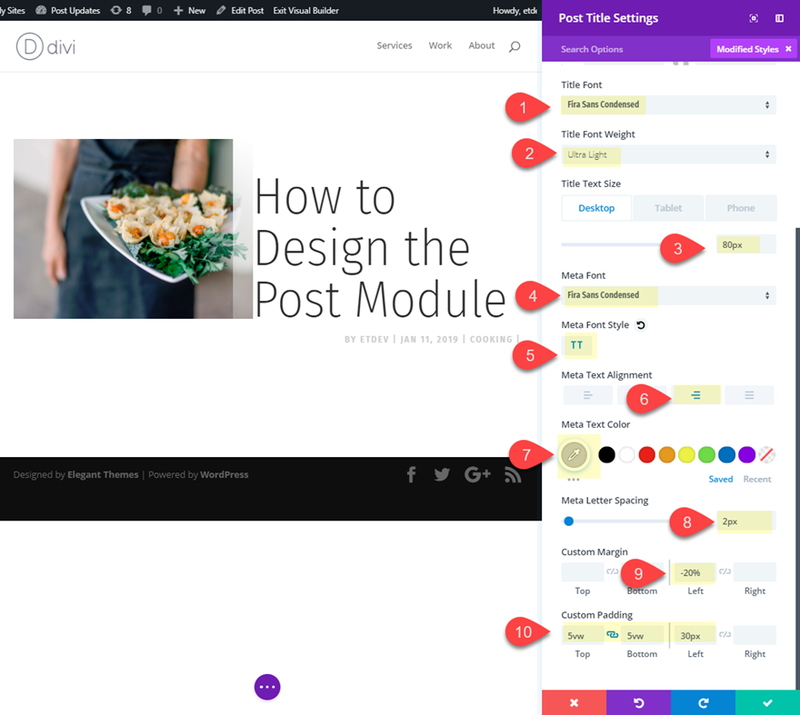 It is up to you whether or not your want to create a new post for each design or simply add multiple post title designs to one post. Just keep in mind that if you add multiple post titles in one post, they will inherit the same page title and featured image. 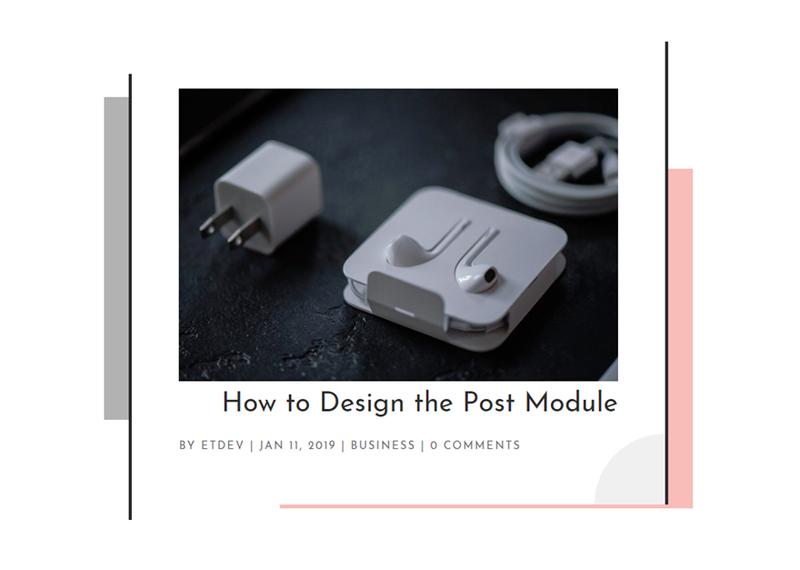 This clean post title design has subtle abstract framing elements that will work well your featured image and post title. The framing effect is created using some custom border and box shadow styling. 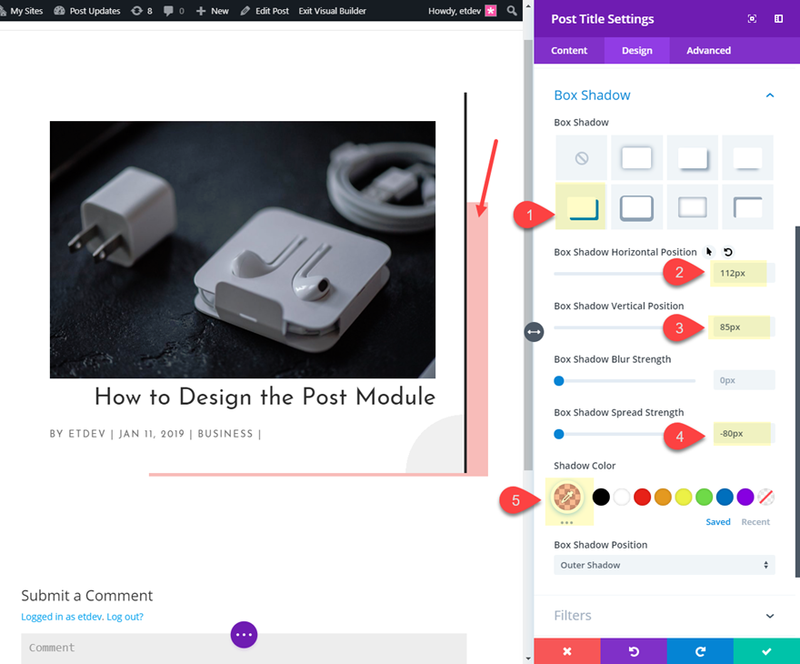 Make sure you setup the new post as described in the beginning of this article (Add Title, Featured Image, No sidebar page layout, hide default post title). Add a new section with a one-column row to your post. 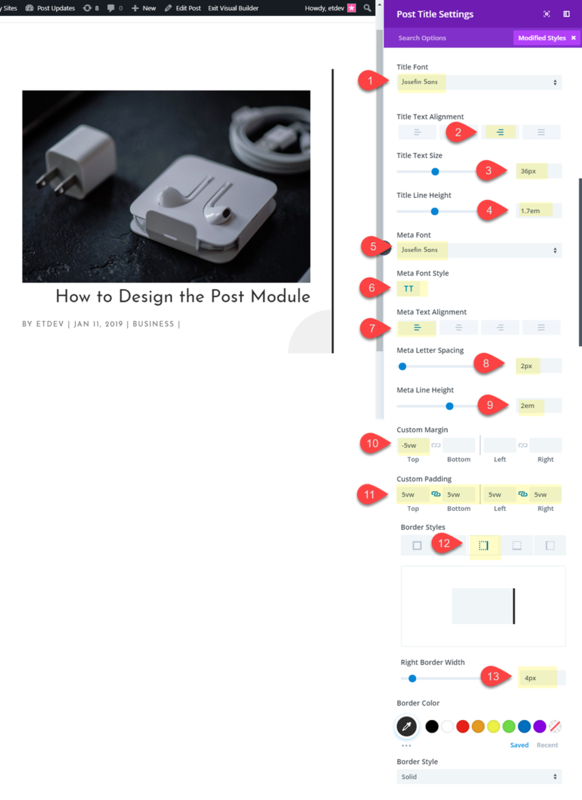 Then add the post title module to the row. 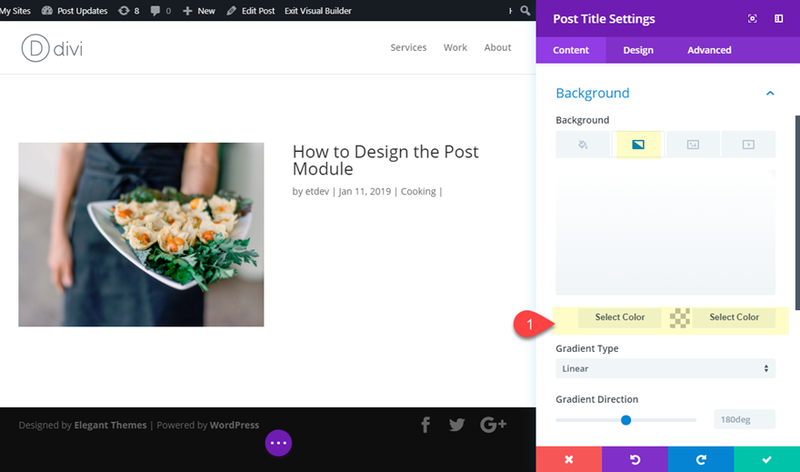 Then update add a background gradient to add a small abstract design element in the bottom right corner of the module. The -5vw margin pulls the module up outside of the row in order for the right border to stand above the left border we will be adding to the row. 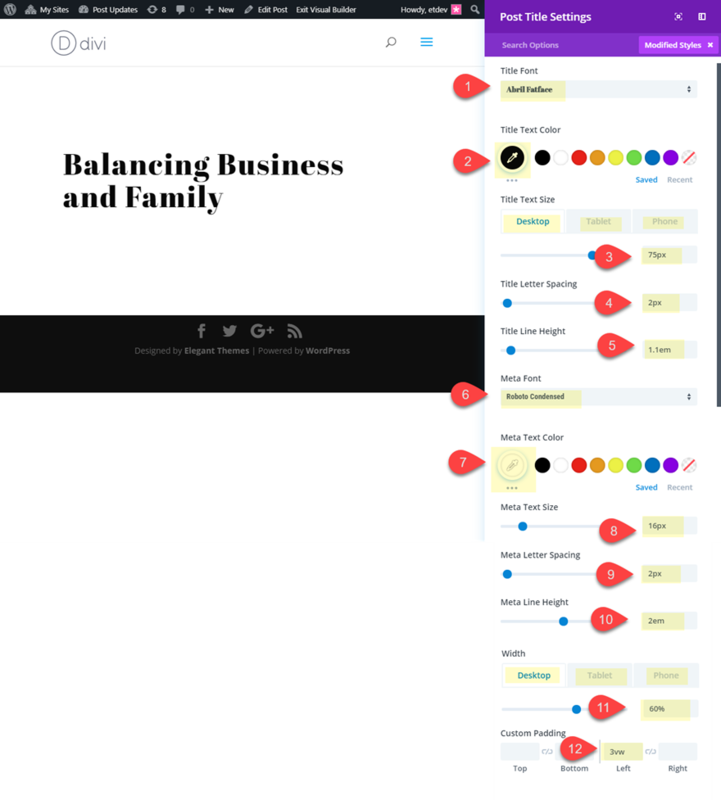 Now open the row settings to resize it and create the left side of the frame design using a border and a box shadow. Create a new section with a two column row. 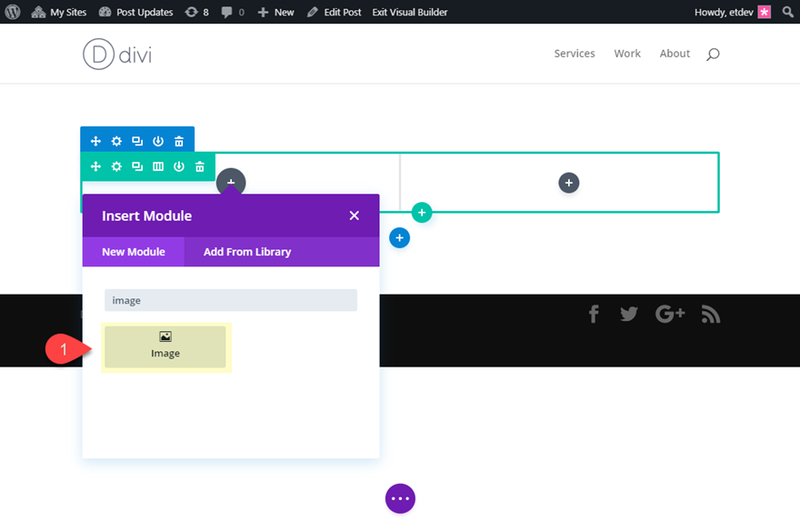 Then add an image module in the left column. This is going to serve as our featured image using dynamic content. 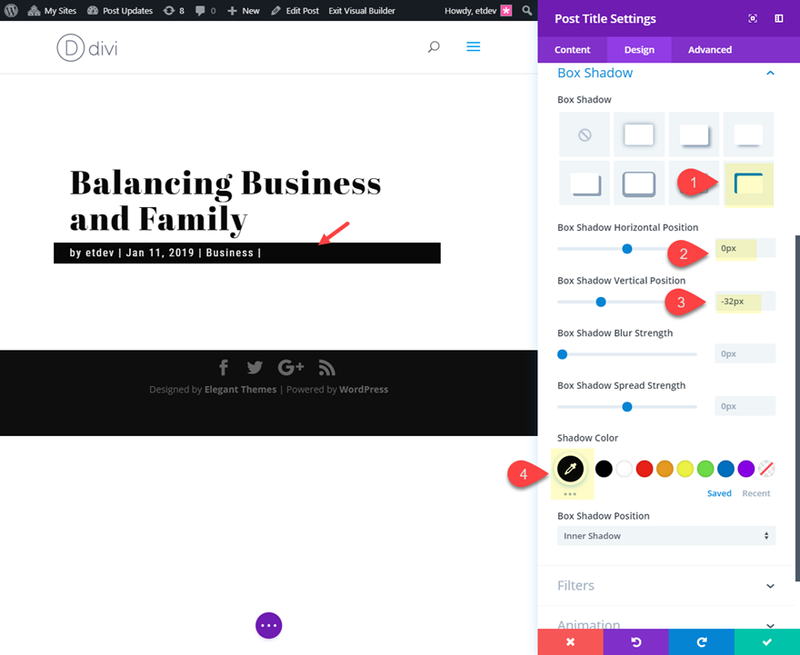 Open the image settings and delete the mock image and click the dynamic content icon in the top right of the image preview box. Then select Featured Image from the list to add the featured image to the page. 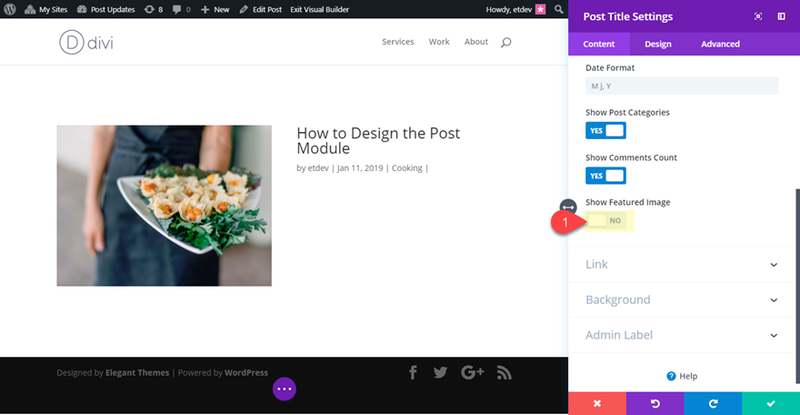 Now add a post title module to the right column. Open the settings and hide the featured image by setting the Show Featured Image option to NO. 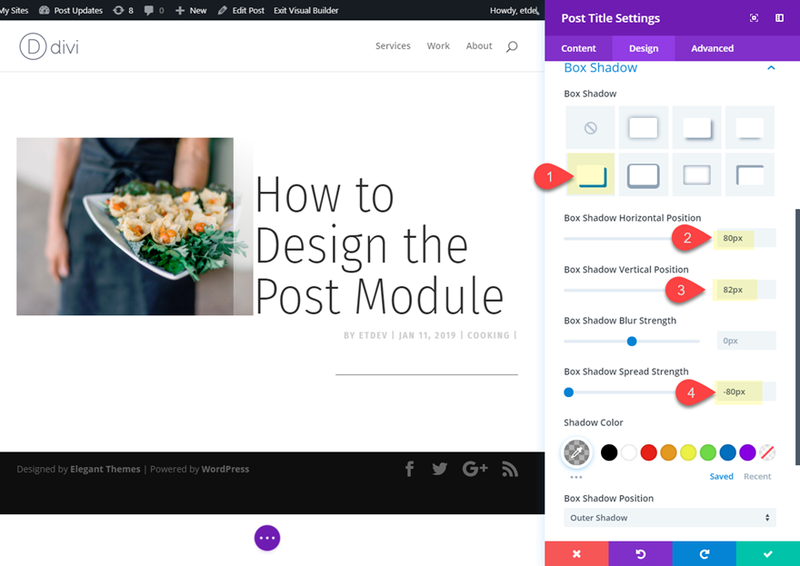 Then add a background gradient to the post title module. This will become visible once we add some negative margin to overlap the image. Now let’s give it a box shadow to create a line under the title. Save setting and open the row settings to adjust the gutter width. This works only if you have Equalize Column Heights set to YES which activates the flex property allowing us to align the items vertically. 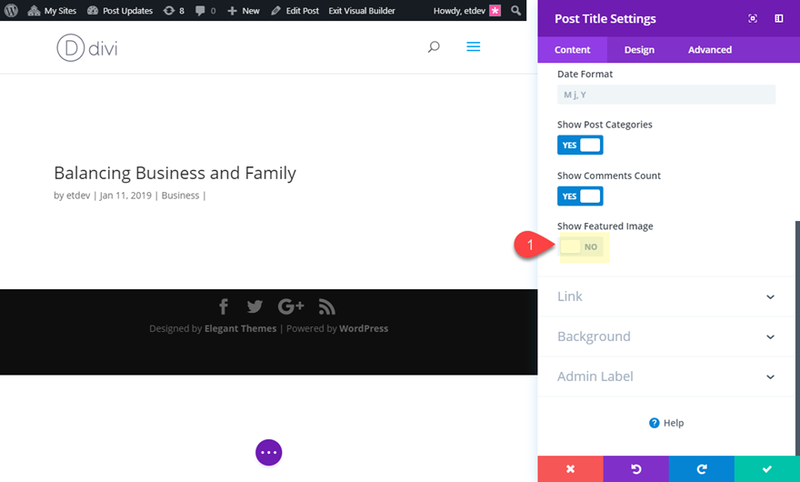 This post title design incorporates background gradients to make the title and meta text more readable with a featured image background. Create a new section with a one-column row. 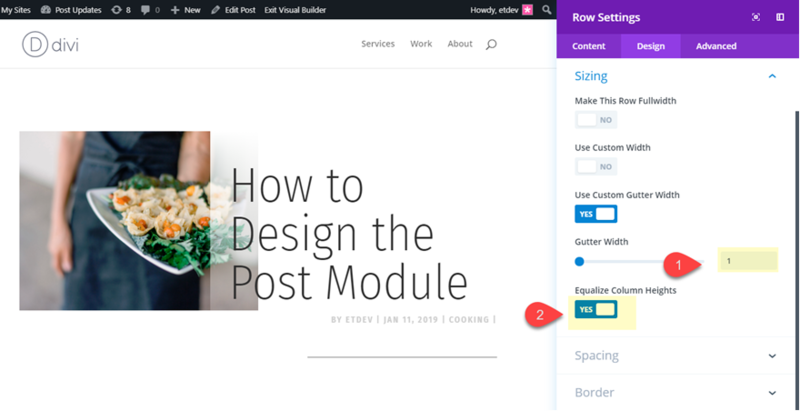 Then add the post title module to the row. 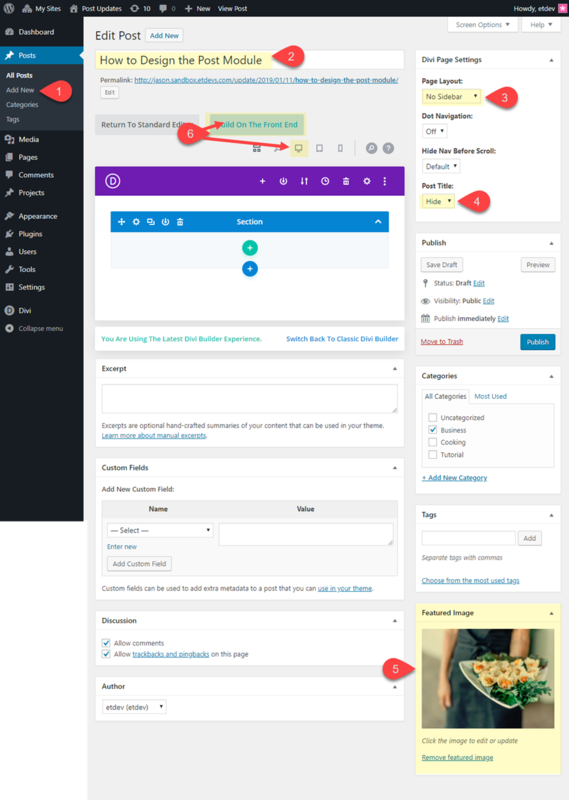 Then update the post title module settings to hide the featured image. Now let’s add a box shadow to serve as a background to the meta text and make it readable. 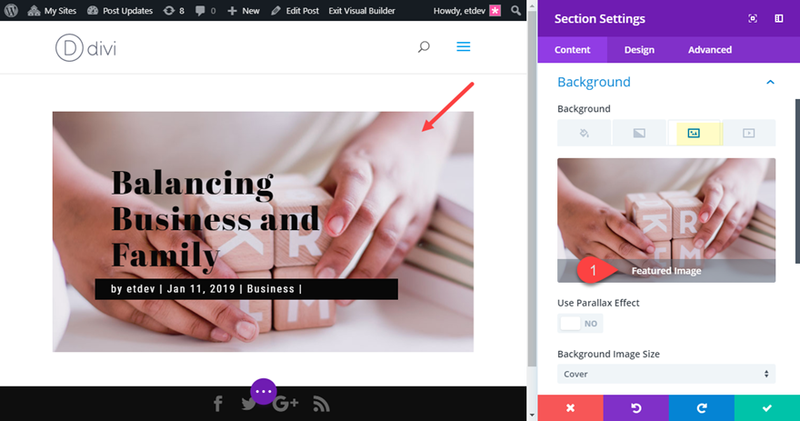 Now we are going to add our featured image to the section background using dynamic content. 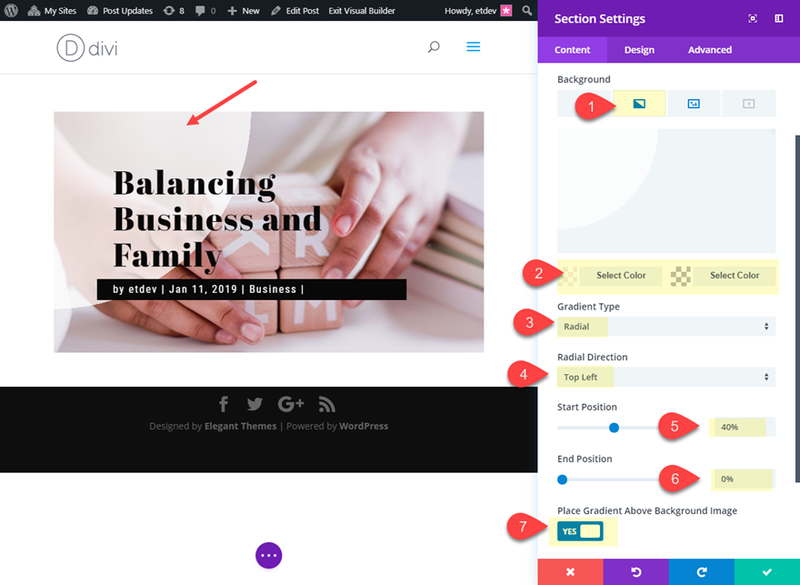 Open the section settings and click the dynamic content icon in the top right of the background image preview box. Then select featured image from the list to add the featured image to the section. Now let’s see the final design. 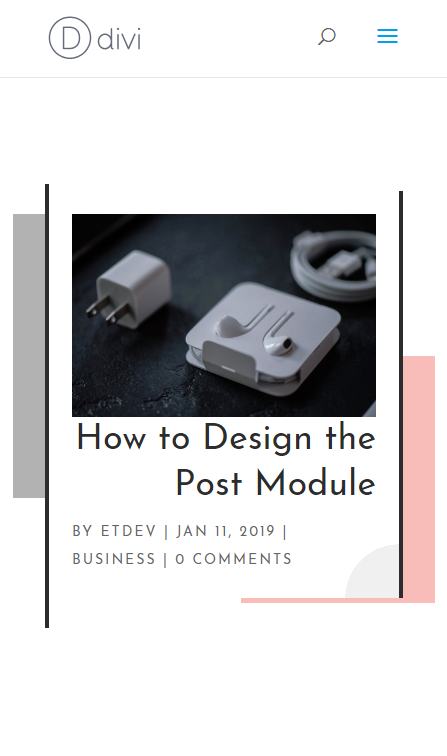 This design incorporates some box shadows to give the effect of stacking the elements that make up the post title module and the section background. 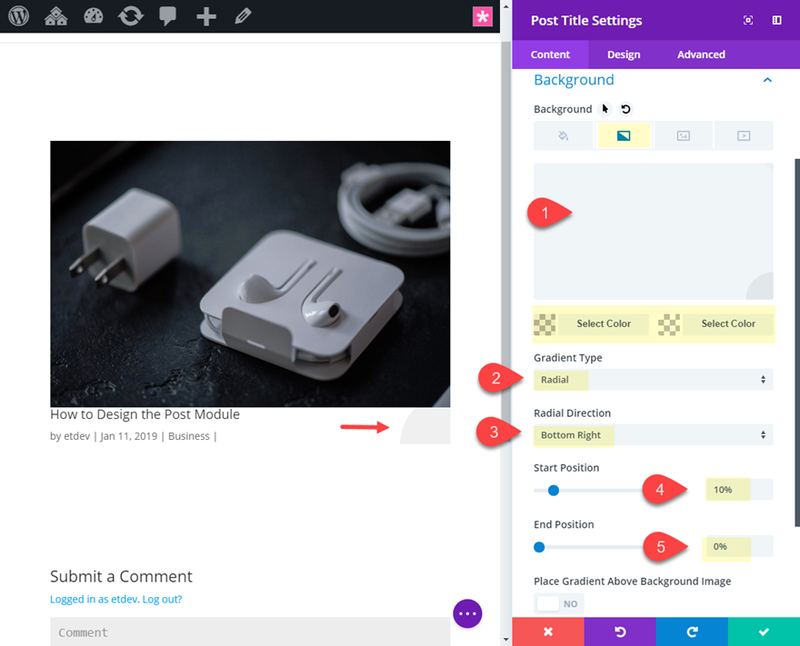 It also uses two versions of the featured image (dynamically) for a unique design element. Create a new section with a one-column row. 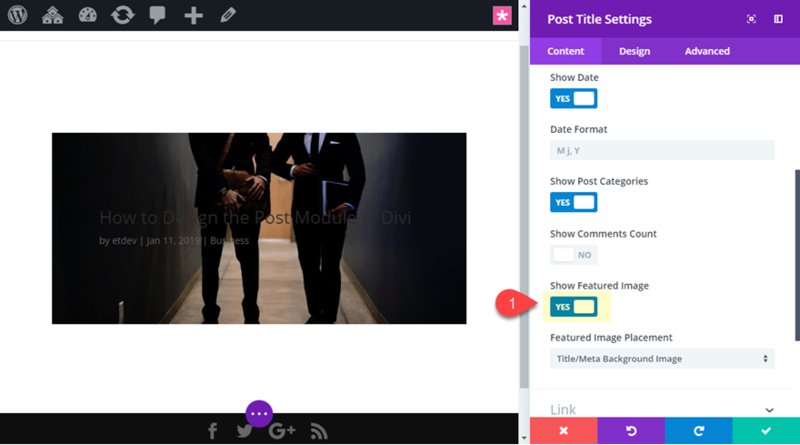 Then add the post module to the row and update the featured image placement to Title/Meta Background Image. Now let’s add our first box shadow to create our first stacking layer. You can see that this also serves as a creative way to divide the title and the meta text as well. 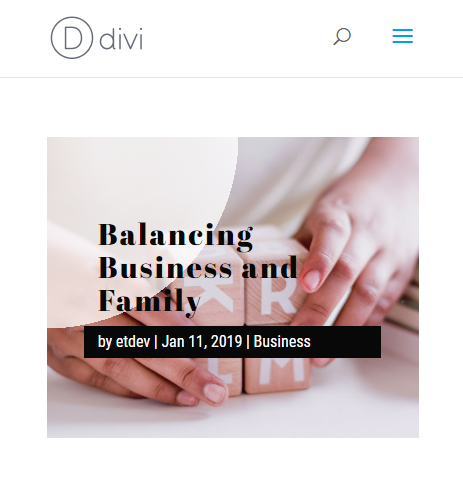 This additional featured image background design is a unique way to give your post title a unique design that will change dynamically with each new featured image. Next, add some custom padding. Then add another box shadow to continue the stacking effect. 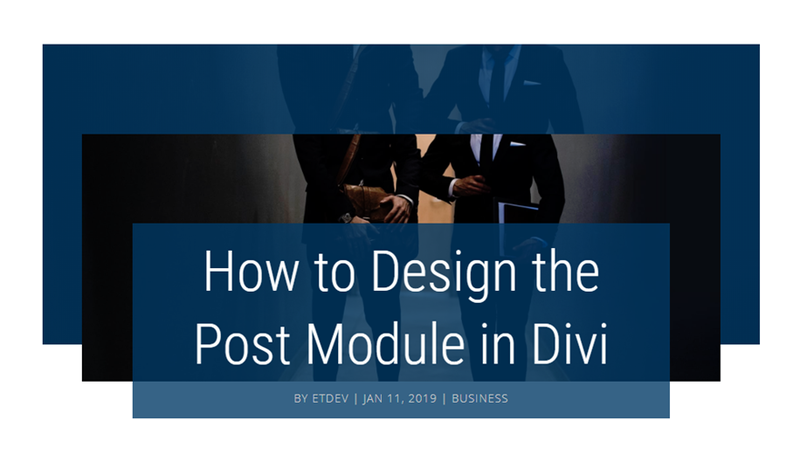 With these post title designs, you should have a pretty good grasp of what’s possible with the Divi post title module and the Divi Builder. 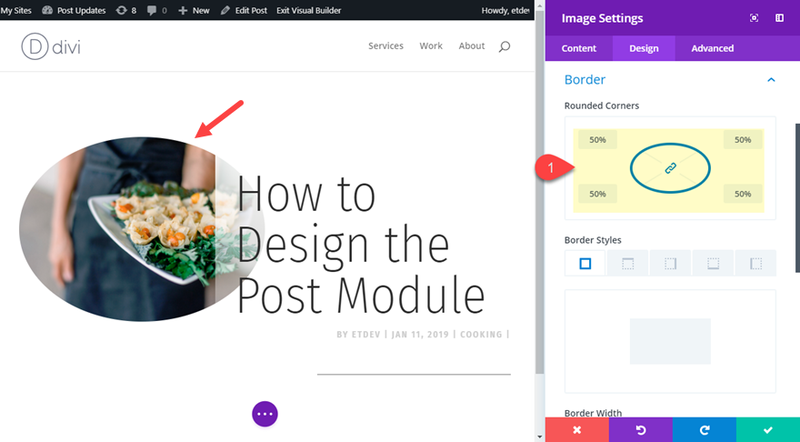 With just a few design tweaks, combined with the power of dynamic content for featured images, you can create countless unique post title styles for your blog posts. If anything, I hope these will inspire you to create some stunning post titles on your own. 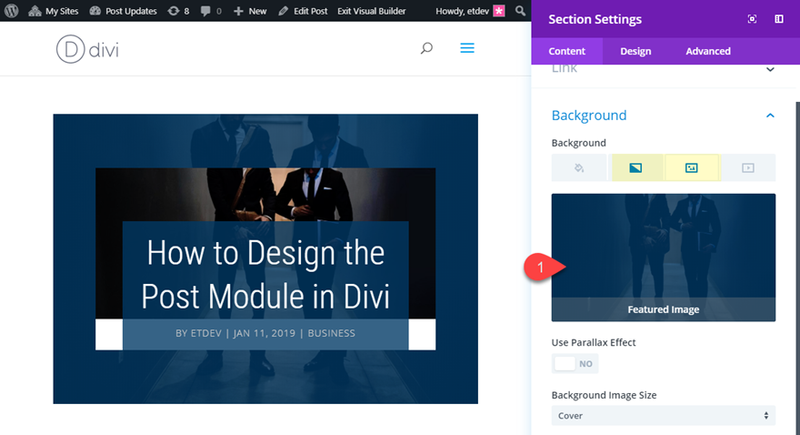 For more related design inspiration, check out our blog post on beautiful and engaging dynamic blog post hero sections and the secret to designing broken grid layouts in Divi. 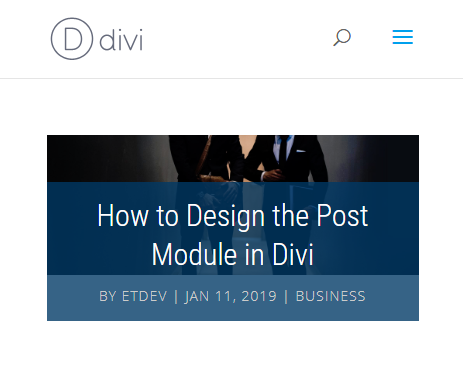 The post 4 Stunning Examples of Divi’s Post Title Module & How to Achieve Them appeared first on Elegant Themes Blog.